Heath was admitted to practice as a Solicitor in April 2005 following a change in careers from registered Podiatrist (admitted in 1997) and a year and a half sabbatical playing Rugby Union in the United Kingdom in 2000 - 2001. Heath commenced his career in law in September 2001 as a Law Clerk in Sydney, working predominantly in the areas of Personal Injury and Workers Compensation, while studying law at the same time. Following admission as a Solicitor in April 2005, Heath spent 9 months on the mid-north coast of NSW working for Walker Smith Solicitors in Taree and Forster, principally in Criminal Law through the Legal Aid Duty Solicitor Scheme. 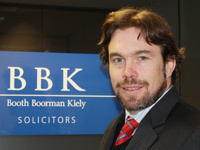 In late 2005 Heath returned to Sydney to work in all areas of litigation. He partnered with Tony in 2010 to form Booth Boorman Kiely. In recent years Heath has focused primarily in assets and property protection focusing on the family, commercial and small business law. Angelique commenced her legal career with Booth Boorman Kiely as a Paralegal in 2012 – working full time whilst simultaneously studying law part time. She obtained her Diploma in Law from the Legal Profession Admission Board in September 2016 and was admitted to practice as a Solicitor in March 2017. Through her work with Booth Boorman Kiely, Angelique has gained practical experience in conveyancing, wills and probate and has assisted in a range of matters including general litigation, NCAT matters, family law and employment law.